My husband and dad are polar opposites when it comes to food. Sieg has a sweet tooth (even with savoury dishes) and loves tons of flavour and spice. My dad on the other hand has a simplistic approach to food and wants everything balanced. Of course, there's me in the middle when I prepare dishes they could both enjoy. Korean food, however, is where they meet. I enjoy Korean food but I don't eat kimchi. SAY WHAT?!?! How can I like Korean food when I don't like kimchi? I love Bibimbap, bulgogi, spicy tofu, etc. There's a lot more to Korean food than kimchi, you know! I bet you thought the red stuff on top was kimchi, well it's not. It's my julienned veggies with sammjang. I like the sammjang flavour, it has umami and a hint of spice. Imagine the flavours of beef bulgogi and bibimbap minus the rice, and my vessel to get it in my belly is the homemade tortillas, yup it's Korean Tacos! I've had this recipe in my head (and sometimes dreams!) for quite a while now. KOREAN TACOS! Is it fusion? Yes and no. Think of it this way, the passengers are Korean but the bus is Mexican. Does that make sense? Okay, okay call it what you like but I'm calling it YUM! Place the beef in a medium saucepan with water, half an onion, a laurel leaf and some peppercorns and bring to a boil, simmer for 2 hours. Strain the broth and separate the meat. Bring back broth to the medium saucepan, meat and add the remaining ingredients for the Korean Pulled Beef. Bring to a boil and let simmer again covered for about 30 mins. Remove the meat and cover, reduce the sauce on low heat until it thickens. About 30 minutes. Shred the beef using two forks. When almost ready to serve, mix in shredded meat with the reduced sauce. Combine julienned vegetables in a stainless steel bowl and mix with the sammjang. Add a little bit more if you want more heat. In a mixer with a dough hook, combine the flour, baking powder and salt. Mix on low. Add the softened butter until it resembles cornmeal. Slowly add the warm water, at this point, the dough should come clean off the sides of your mixing bowl. Let knead in the mixer for another minute. Let the dough rest for 30 mins. Divide dough into 24 small balls or 12 bigger ones. Roll out into circles with a rolling pin. Heat a non-stick skillet and cook the dough on both sides, about 2-3 minutes on each side. 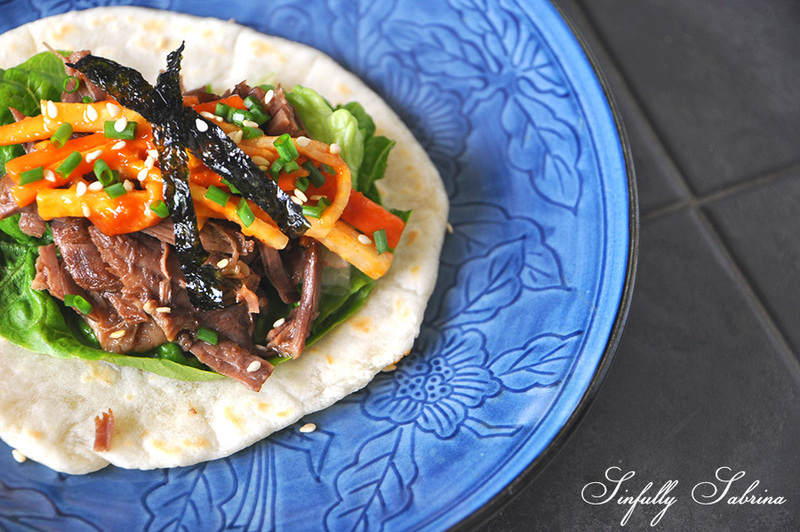 Lay the cooked tortilla on a plate then the lettuce and top with the pulled beef, bibimbap vegetables, green onions, seaweed strips and sprinkle with toasted sesame seeds. The homemade tortilla recipe makes 24 mini wraps.